Got these beans from SG when I was back the last trip. Managed to find potato starch at Daiso here as well. 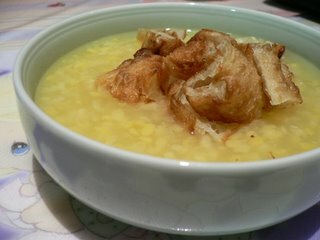 So here I am, presenting my Tau Suan with You Tiao. It has been a one year since I ate this. Always 4get to eat this whenever I get to go back home. And now, we can eat it anytime, and Oh! I didn't make the You Tiao from scratch. We went for dim sum early morning today & bought these back, a good time to make this dessert finally. 1) Roughly wash beans & soak them in water for 30mins. Drain & set aside. 2) Boil a pot of water, add in beans & sugar. Stir slightly. 3) When beans are soft, remove pot from stove, pour in potato starch solution while stirring the beans mixture in pot with ur other free hand. This is important as it helps to prevent the lumpy starch mixture. Stir till mixture thickens. 4) Put pot back to stove & 'cook' the starch for 1min. 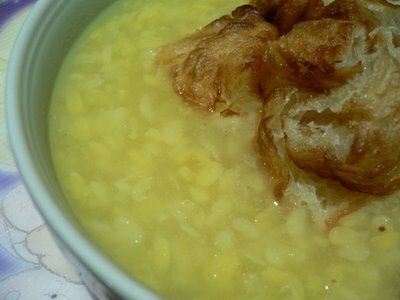 Serve warm with You Tiao slices.